Ramadhan Mubarak to all Muslims worldwide. Alhamdulillah, the holy month of Ramadhan is back and once again, we would have our much awaited trips to Kampung Baru for the tastiest and the most delicious iftar food you could ever find in Malaysia, Bubur Lambuk Kampung Baru! Bubur Lambuk is available throughout KL of course and most parts of Malaysia but yet, years after years, people from all over Selangor and Kuala Lumpur would stop by at the Masjid Jamek Kampung Baru or also known as Masjid Kampung Baru for the original version of the bubur lambuk Kampung Baru which is extremely hard to find elsewhere. 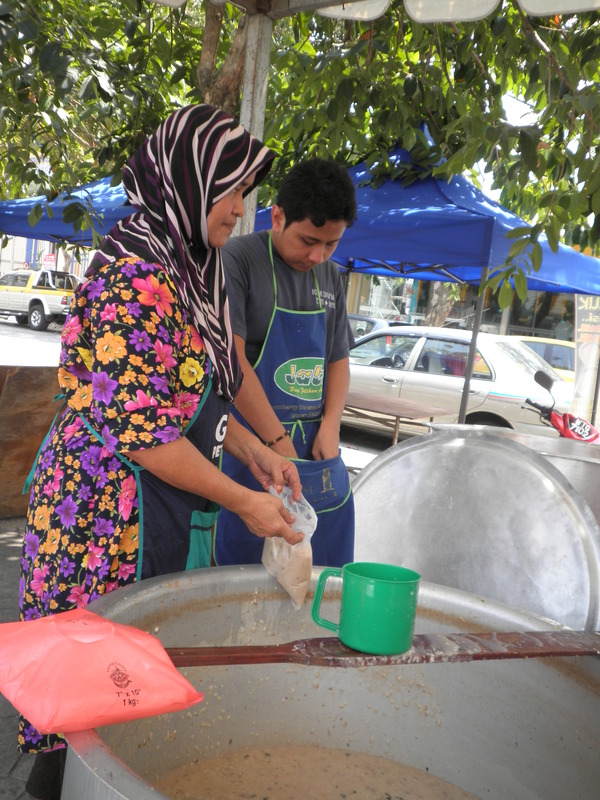 Ali and Aeshah watches as Aunty Sham prepared the bubur lambuk for her to sell. I remember when I was younger and once my mother was admitted to the Kampung Baru Medical Center, which stands just across the road from the mosque, during Ramadhan, I stood by the window watching the queue grew and grew until there were probably fifty people lining up at one time for the bubur lambuk from the mosque. The place wasn’t packed with vendors at it is now. If you live nearby or regularly visit the area during Ramadhan, you would know how crowded the area is; sometimes it feels like you’re driving through a marketplace. Of course, simply anyone could set up a stall and sell their own version of bubur lambuk Kampung Baru, so if you do not wish to wait in the mosque’s long queue, you have to be very selective in choosing which vendor to buy your bubur lambuk from. The taste can differ drastically, so it’s wise to ask advice from a person who regularly buys their bubur lambuk from the area. And I have to say, the best bubur lambuk Kampung Baru I could find would be Aunty Sham’s. The secret is, Aunty Sham cooks her bubur lambuk using the original recipe as those from the famous Masjid Jamek Kampung Baru’s. So now you can have your original Bubur Lambuk Kampung Baru without waiting in the long queue! And at RM2 per pack (a very generous pack, I may add) it’s more than worth the long trip… after all, bubur lambuk isn’t available throughout the year. Oh, and there are a few things to keep in mind when buying bubur lambuk. 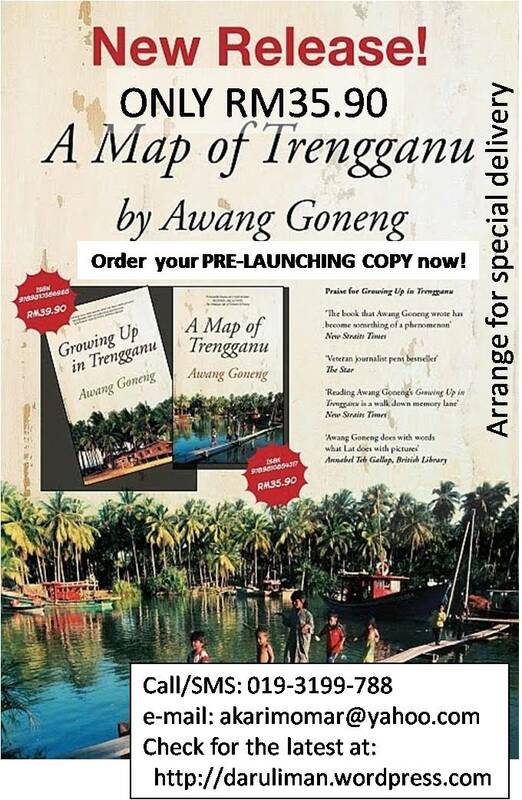 One thing is that you’ll have to come and buy yours early. Once, my father arrived at the stall at around 2:30pm but came back empty-handed as Aunty Sham had sold out her bubur lambuk although the other vendors were still selling their wares. So it’s important to be there early if you do not want to be disappointed. Also, we have heard that some of the vendors would claim to be anyone, including Kak Sham so you’ll have to be careful. 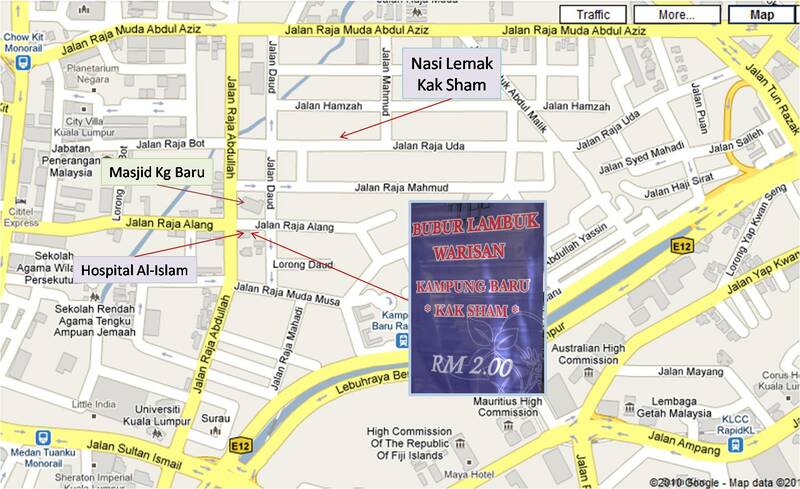 Use the picture below as a guide to Aunty Sham’s stall and look for the banner, ‘Bubur Lambuk Warisan Kampung Baru Kak Sham’. Bubur Lambuk Warisan Kampung Baru Kak Sham. Her stall is on the second from right from the Jalan Raja Alang – Jalan Raja Abdullah crossroad. It’s right in front of the carpark of Al-Islam Hospital and is on the opposite side of the road from the Kampung Baru Mosque. Please click for a bigger and better image. Ramdhan Mubarak to all Muslims! Alhamdulillah, the holy month of Ramadhan is back with us and once again, vendors flock the streets around the Kampung Baru Mosque to sell the much loved and awaited iftar delicacy, Bubur Lambuk Kampung Baru. Since this special porridge is only available during the month of Ramadhan, hundreds of people from all parts of Selangor and Kuala Lumpur could be seen lining up to get their share of this delicious dish. Of course, bubur lambuk is given out by many (usually mosques) all over Malaysia but up till now, no other bubur lambuk that I know taste as good as the Bubur Lambuk Kampung Baru from the well-known Masjid Jamek. Due to the fact that the Masjid Jamek Kampung Baru is so famous for its ‘bubur lambuk’, the queue at the mosque would be very, very long and some may even have to wait for over an hour for a pack of free bubur lambuk. Those who would rather skip queuing may buy the dish from the many vendors who set up their stalls around the area for about RM2.00 per pack. Unfortunately many were disappointed since the bubur lambuk sold by the vendors taste far different than those given out by the mosque. However, there is one stall that sells the authentic Bubur Lambuk Kampung Baru and taste just as good the ones given out by the mosque, ‘Bubur Lambuk Kak Sham’. 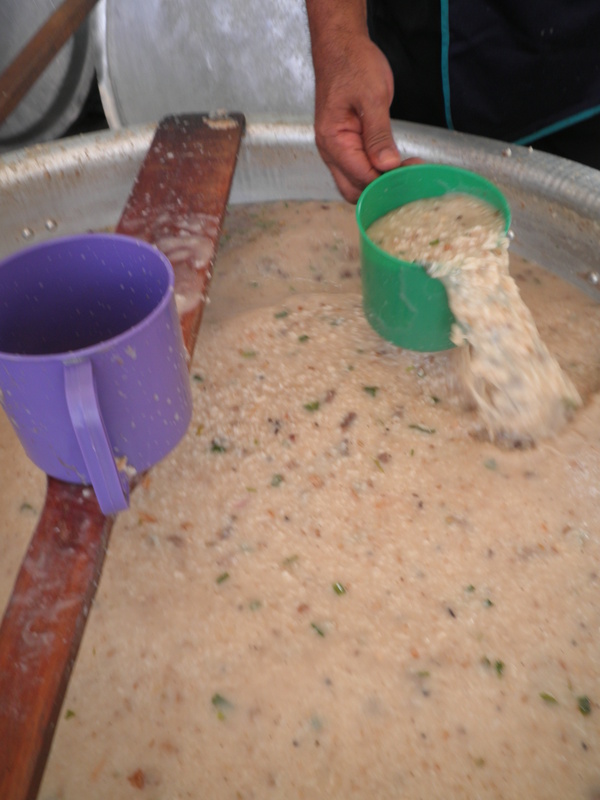 If you have not tried the authentic bubur lambuk Kampung Baru, you should try to get some before Ramadhan ends. Believe me, it is worth the trip especially for those who love bubur lambuk. We stay in Ampang and there are lots of places around our area that give away free bubur lambuk (without us having to queue) but we would still be making our journeys to Kampung Baru for our bubur lambuk; and it has to be Aunty Sham’s, of course. And it is always nice to see the delighted faces of our friends when we send them the delicious bubur lambuk. If you are a bubur lambuk lover like I am or have never tasted the famous Bubur Lambuk Kampung Baru before, try to queue at the Masjid Jamek for a pack or just drop by at Aunty Sham’s stall which is opposite the mosque and you would surely be back for more. 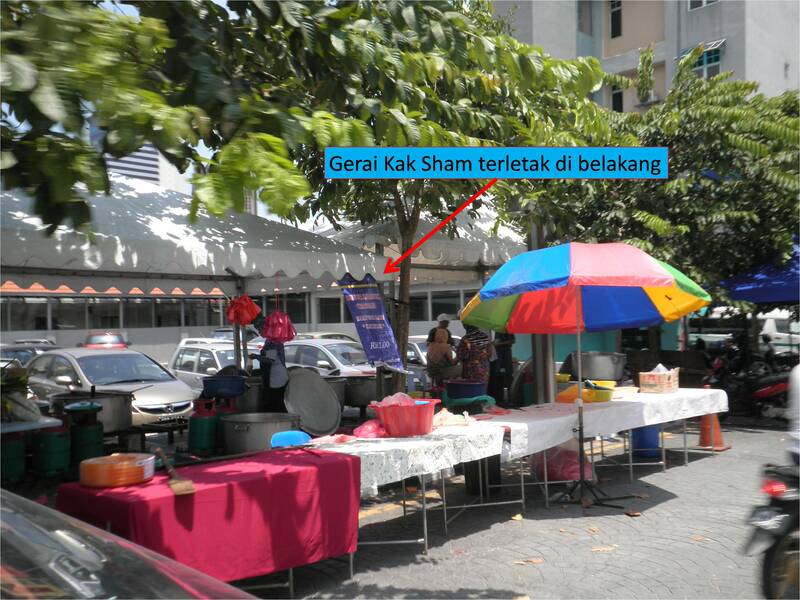 Aunty Sham’s stall is located in front of the Al-Islam Specialist Hospital. Here is a photo of Aunty Sham’s stall. It is at the back of another stall. Ramadhan Mubarak to all Muslims worldwide. Starting from today, we can once again enjoy the Malaysia’s best iftar – the ‘bubur lambuk’. Although this wonderful porridge can be found all over Malaysia, ‘Bubur Lambuk Kampung Baru’ from the famous Masjid Jamek stole the show. Everyday, hundreds of people from all parts of Kuala Lumpur and Selangor could be seen lining up for some of this mouth-watering delicacy. But for those who are willing to pay RM 2.00 (for a pack of bubur lambuk) to skip the extremely long queue, I suggest that you should buy the ‘Bubur Lambuk Kak Sham’ sold by Aunty Sham who is a good friend of mum’s. As far as I know, Aunty Sham’s bubur lambuk is the best compared to the many other bubuk lambuk stalls around the mosque, with the taste as authentic as the famous Kampung Baru’s Masjid Jamek’s bubur lambuk. Today, my dad came home from the mosque with a gigantic bag of bubur lambuk. The aromatic scent immediately spread throughout the house. My little brother (who is trying to fast for a full day for the first time) was walking down the stairs when he stopped in his tracks. The familiar appetizing smell floated into his tiny nose and forced him to run back fearing of breaking his fast. He announced that he is going to stay upstairs until Maghrib approaches. I once had an experience like his when I was a year older than him. Only that in the end, I had to break my fast after struggling really hard to hold back my hunger. But how could I not when I was in the car sitting right beside packs of aromatic bubur lambuk throughout the whole journey back home from Kampung Baru? If you are a fan of bubur lambuk and have not yet tried the Bubur Lambuk Kampung Baru, please make a trip to Kampung Baru before the end of Ramadhan. Try the famous Masjid Jamek’s or those from Aunty Sham’s stall and you’ll be back for more! And for the Bubur Lambuk Kampung Baru’s lovers, well, I don’t think that I need to remind you of this incredibly tasty dish. Ramadhan will remind us of the delicious smell of spices and will send us all the way to Masjid Jamek Kampung Baru for this lovely savoury porridge! Bubur Lambuk Kampung Baru – is finally back! Ramadhan Mubarak to all muslim readers worldwide. Last year, I wrote a post entitled ‘Bubur Lambuk Kampung Baru’ (please click here to read more). Bubur lambuk is the tastiest food for iftar and the bubur lambuk given away by the Kampung Baru Mosque/Masjid Jamek is the best amongst all. People from all over KL came for the bubur lambuk. 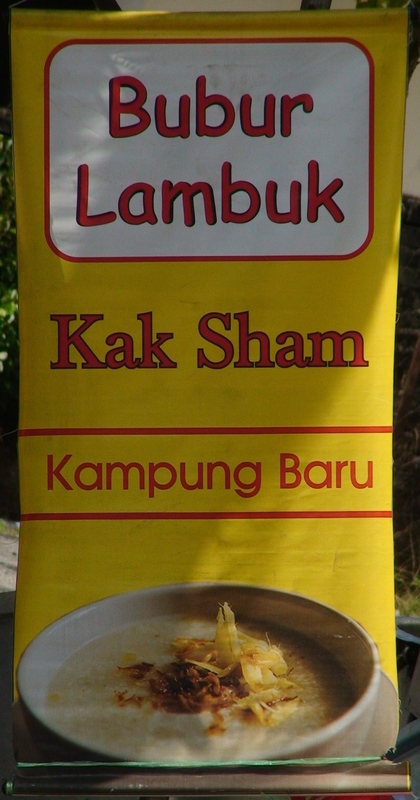 And what makes bubur lambuk more special is that bubur lambuk is only available in the holy month of Ramadhan. called Aunty Sham, she said that she was not at her stall but at the back of the mosque. Mum and I went to meet her at the tent number 8. She voluntered herself as one of the bubur lambuk cooks at the Kampung Baru Mosque for the ‘Majlis Perasmian Bazar Ramadhan’ this evening. There were abundant of bags of bubur lambuk. I guess there would be around a thousand containers of bubur lambuk to be given away. So if you are living somewhere near KL, hurry up and get yourself some of the tasty bubur lambuk now! Bubur lambuk is a special kind of Malay porridge prepared especially for iftar/ futur (the break of fast) during the fasting month of Ramadhan. 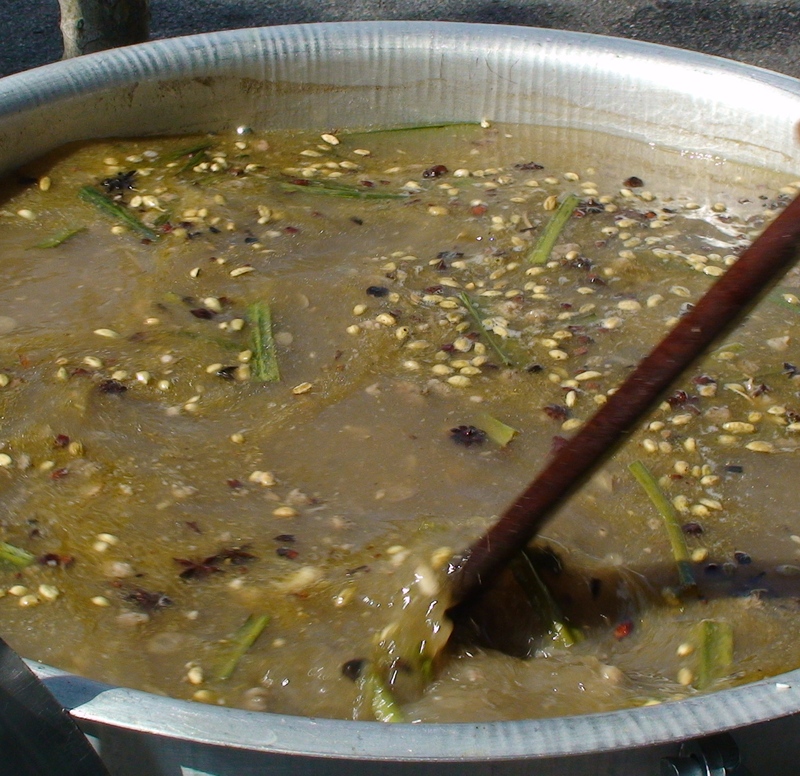 In Malaysia we have various versions of bubur lambuk which tastes differently from one another. Yesterday we had ‘bubur lambuk Kg Baru’ for iftar. My siblings and I really love the bubur lambuk. It is light but filling and also very, very tasty. 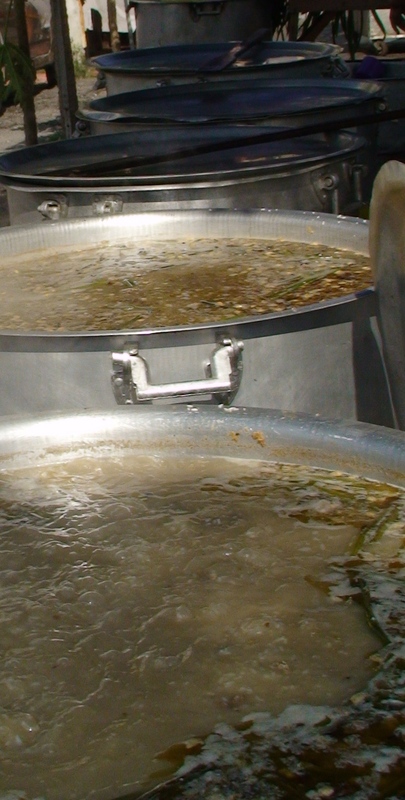 The most famous bubur lambuk in KL (and one of the tastiest) are the ones prepared by the Kampung Baru Mosque known as ‘Bubur Lambuk Kambung Baru’. 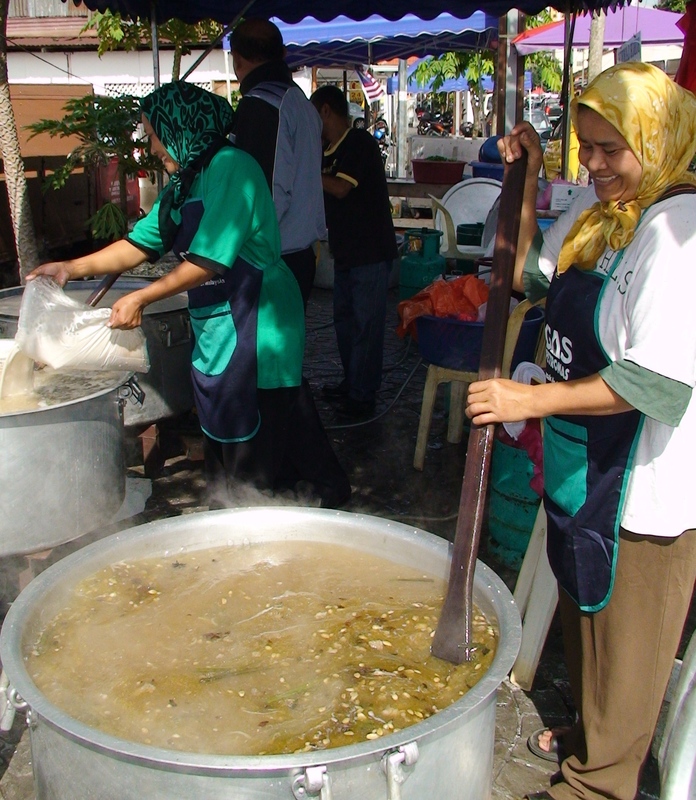 You will not miss it – Bubur Lambuk Aunty Sham – just across the main gate of Masjid Kg Baru and a clear bunting! What makes bubur lambuk Kampung Baru so delicious? I guess it must be the aromatic spices used in preparing this delicious porridge, it’s special recipe and also the expertise of the cooks. Somehow it is real hard to enjoy the original bubur lambuk that was given away by the Kampung Baru Mosque every Ramadhan; for the queue is always very, very long. I heard that people came from all over KL for the bubur lambuk. I had tried it and it was very, very delicious! Nowadays there are lots of stalls selling bubur lambuk around the mosque but I think the tastiest is ‘Bubur Lambuk Kak Sham” in Jalan Raja Alang. We got to know the wonderful Aunty Sham years ago . At that time she ran her nasi lemak business next to Kampung Baru Medical Centre. Aunty Sham and her brothers used to be a part of the team that prepares the bubur lambuk at the Kampung Baru Mosque. Hence her bubur lambuk is as good as the original bubur lambuk Kampung Baru. 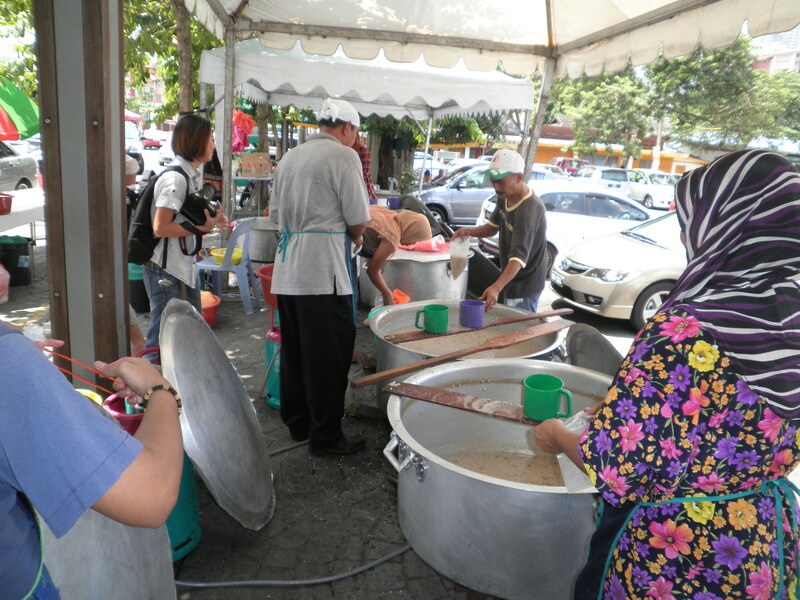 So, one can enjoy the ‘real’ bubur lambuk Kampung Baru without having to queue for the ones given away by the mosque. Imagine enjoying a hot bowl of the delicious bubur lambuk with it’s mouth watering aroma for iftar… When I was eight, I once had to break my fast at about 2 pm for the aroma of the bubur lambuk in the car makes me too hungry. Since then, I never follow dad to Kampung Baru to buy the bubur lambuk until I was much older. Even now the mouth watering aroma still can make me hungry! 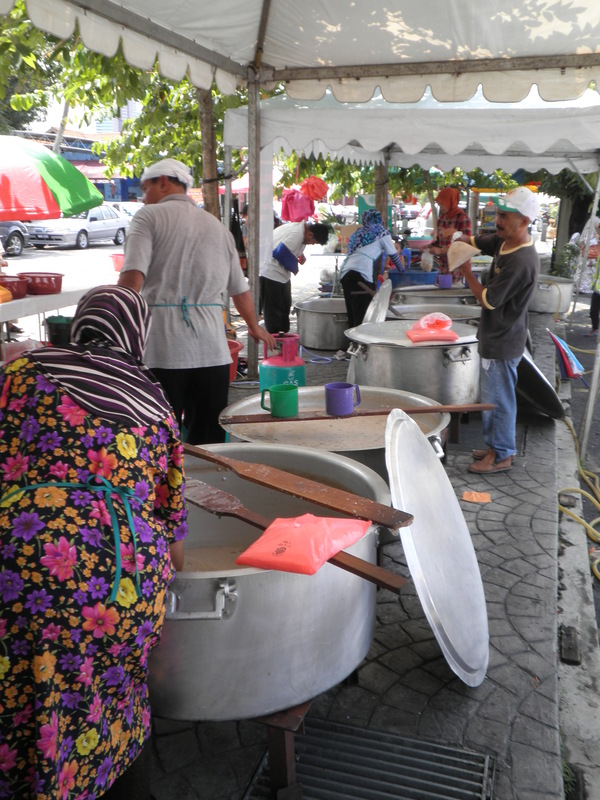 … pots and pots of bubur lambuk … about 200 of RM2.00-pack per pot!!! 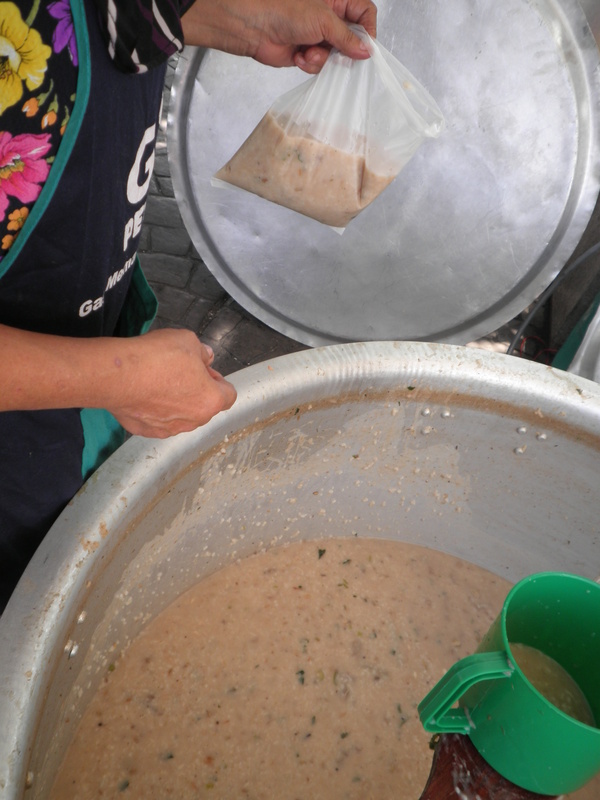 It must be Aunty Sham’s secret recipe that makes her bubur lambuk a hit among bubur lambuk lovers. I’ve tried others but they were not as tasty as the ones prepared by Aunty Sham. No wonder she cooks pots and pots (huge pots) of bubur lambuk everyday… Since bubur lambuk is only sold during the fasting month , I always look forward to enjoy this delicious dish every Ramadhan. Since bubur lambuk is only sold during the month of Ramadhan; Aunty Sham would be selling her very delicious ‘Nasi Lemak Kak Sham’ for breakfast in Jalan Raja Uda during other time of the year. We have to reach her stall early in the morning to buy her nasi lemak because like her bubur lambuk, her nasi lemak would be sold out very fast!